20 or 35 ton Power Team punches make endless drilling a thing of the past. They produce holes through a maximum material thickness of 12.7 mm in seconds. They are portable and therefore perfect for construction, maintenance and service applications. They can be mounted on a work bench for production jobs. The heavy-duty, forged steel “C Frame” makes the punches strong and durable, whilst the carrying handle enables precise locating. The 35 Ton punch (HP35) has a dual action, spring-loaded stripper which holds material during the punching operation, then strips material from the punch on return. The HP35 has scribe lines on the stripper to aid in locating the punch. Power Team’s electric/hydraulic PE172 pump is a perfect power source. Take a look at our hydraulic metal hole punch selection available at SGS. We’re sure to have the metal hole punch tool from this reliable make for the right price that will see you complete all your metal punching quickly and efficiently. If you are searching for a hydraulic hole punch then you have come to the right place. 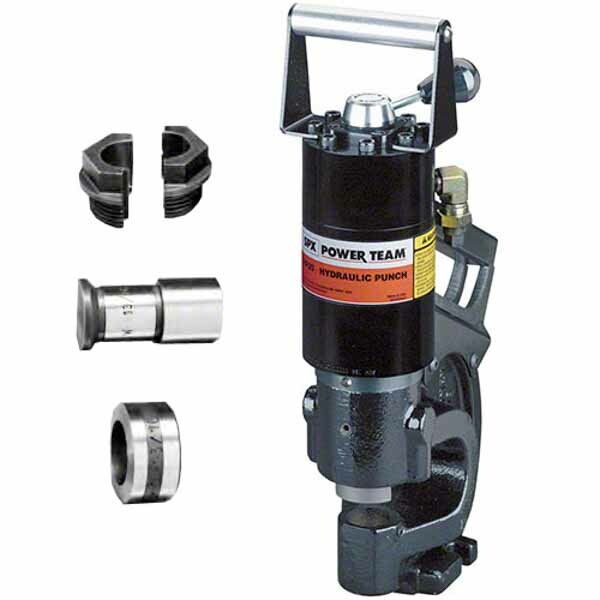 We offer an extensive range of quality hydraulic tools from Power Team, including steel punches. Our hydraulic hole punch products are manufactured to the highest standards and our prices are extremely competitive, so take a look at the metal hole punch machine options on this page. We supply 20 and 35-ton Power Team punches to make endless drilling a thing of the past. The metal hole punch produces holes through a maximum material thickness of 12.7 mm in seconds. The hydraulic hole punch devices are portable and therefore perfect for construction, maintenance and service applications. A metal hole punch is really practical and can be mounted on a work bench for production jobs. The heavy-duty, forged steel “C Frame” makes the metal hole punch tool strong and durable, whilst the carrying handle enables precise locating. The 35 Ton punch (HP35) has a dual action, spring-loaded stripper which holds material during the punching operation, then strips material from the punch on return. The HP35 has scribe lines on the stripper to aid in locating the punch. Power Team’s electric/hydraulic PE172 pump is a perfect power source. Quality hydraulic metal hole punch tools can be found here at SGS in abundance. This includes steel punches, so call today to discuss your requirements and prices. Telephone 01332 576 850 for our prices and technical hotline, and invest in an excellent hydraulic hole punch today. We will also be happy to advise you if you have a specific model for anything from steel punching to general use metal hole punches, so don’t hesitate to get in touch.